I received an email from CAIR (Council on American-Islamic Relations) a few days ago with a link to an article published in an American-Jewish newspaper called the 5 Towns Jewish Times. The author of the article had advocated the killing of innocent Muslim civilians as an "appropriate response" to terror acts committed by those claiming to be co-religionists. Only a few hours after the article was posted online (and after I had visited it myself), the article link on the website was no longer valid. A search of the 5 Towns Jewish Times showed that the article had been removed. However, the print version of the article is still available in a PDF format of the whole newspaper. I thought I would post the article on my blog for readers to make an independent assessment of the thought-processes of this Jewish writer. And the thought-processes of the 5 Towns Jewish Times editor who had believed it was ethical to publish the article. Some of the greatest discoveries of medical science, most notably penicillin, have been made by sheer accident. It is a signal tragedy of our times that, in the all too conspicuous absence of competent statesmanship among the leadership of democracies around the world, the solutions to certain international security issues must also be discovered by accident. About six months ago, there was an article published in the New York Times about an incident in Afghanistan where the U.S. military, while attempting to take out a certain Taliban terrorist, dropped a bomb on a tent that was occupied by members of his extended family, killing several women and children. The particular terrorist that was being hunted was not home at the time, although there were several others that were part of the same terrorist network who were also killed. This story ostensibly was published for the purpose of demonstrating the "horrors" of warfare, focusing primarily on the women and children in the tent who were killed, by all accounts of the U.S. military spokespeople, unintentionally. In our dangerous age of political tentativeness and compromised militaries, however, there is an overwhelming probability that even top-ranking U.S. military commanders were unaware that they may have accidentally stumbled upon the solution to international terror. I’ll never forget how, during the last Lebanon war with Hezbollah, an Orthodox Jewish Russian immigrant who had survived Stalin approached me, gesturing with his hand while repeating the word "tzetlach" ("notes" or "letters" in Yiddish). He was referring to the pieces of paper which were dropped by the Israeli Air Force over Lebanon warning civilians of the bombs that were about to be dropped. In the process, the Hezbollah terrorists were also warned, which may have allowed them to escape to the north in large numbers and ultimately force Israel to belatedly engage its ground troops, leading to numerous casualties and the loss of the war. "Did Stalin drop tzetlach when he bombed Berlin during the Second World War?" my Russian immigrant friend asked, obviously comparing the militant, pro-Hezbollah Lebanese civilians to the citizens of Germany during the Holocaust. The United States, it seems, did in fact originally institute the practice of dropping leaflets over an enemy population, as it did before it bombed Dresden and Berlin, but apparently Stalin had his own ideas. Israel was apparently afraid to stray from the U.S. precedent even if it meant risking the loss of a war. In terms of Jewish law, I think that the issue is probably clear. While no army should go out of its way to harm a civilian population in times of war, during the legitimate pursuit of an enemy that has instigated an attack against its people, a nation may defend itself with whatever means necessary, even if it includes causing death to civilians. Those who are inclined to issue knee-jerk gasps to this common sense state of affairs that is etched in the Mosaic law are probably easily forgetful of the fact that Muslim countries are routinely targeting innocent civilians via their terrorist proxies and leaving the standing armies of nations alone. Whatever the level or degree of the Pakistani government’s complicity in the attack that is ultimately that this operation could not have been accomplished without assistance from Pakistani Intelligence. This factor makes the Mumbai attack as much of an attack on India’s sovereignty as it was an attack on its civilians and foreign visitors. As such, it cries out for some type of retaliatory attack by the Indian government. Aside from India, however, the attack on the foreign nationals of Israel, the United States, and Great Britain by proxy also constitutes an act of war against these countries and therefore legitimizes the infiltration of Pakistani territory for the purpose of pursuing the aggressors. While a generalized war with Pakistan should not be contemplated or pursued, it may be unavoidable, depending upon the vigilance with which Pakistan seeks to defend the terrorists within its borders. The retaliation that is undertaken should strike hard at the training bases, madrassa schools, and homes of all the properly identified terrorist commanders and fellow terrorists of those identified in the attack, in a series of sustained surprise attacks over a period of time that is aimed at total eradication of the entire network that coordinated this attack. Any and all collateral damage in the form of casualties to friends, relatives, or anyone connected to the lives of these terrorists should be swiftly ignored. Public opinion and what is written in the newspapers should also be ignored by nations seeking to avenge the death of its innocent civilians. When terrorists undertake to hide behind a sovereign government and to attempt to hide within its borders, it becomes the responsibility of that government to take swift action to flush them out and to neutralize them. Pakistan has obviously not done this, and is itself responsible for failing to purge itself of rogue commanders who facilitated the carnage in Mumbai. It must now step aside and let the foreign governments whose citizens have been mercilessly attacked take the proper course of action. George W. Bush certainly knows how to do it, and if his heart will be in the right place, so does Barack Obama. As for the Islamic terrorists themselves, there has been a universal ineptitude in understanding their mentalities and how they work. Primarily because of leftist leaders and public sympathy with revolutionary mindsets, which have in cancerous fashion infiltrated the efficient workings of Western governments and Israel, the tactics that are necessary to defeat Islamic terror have been suppressed and discarded as politically incorrect. Many will remember how before Shimon Peres encouraged Prime Minister Rabin to embark on his infamous peace process with Arafat, the latter advocated "breaking the bones" of Arab rioters in the West Bank and Gaza as a means of putting down the intifada. Those means were apparently used for a period of time by Rabin, with much success, until his government decided to embark on a seriously unwise course of conciliation with premeditated and avowed murderers. President Bush also delivered a setback to his own war on terror when, in the immediate aftermath of 9/11, he labeled Islam a peaceful religion that had been hijacked by radical elements. By making that statement, the president all but rejected the possibility of taking drastic action to eliminate entire terrorist networks that would of necessity cause the mass deaths of other potential operatives, and those others clandestinely associated with the actual terrorists, who provide means of support. Contrary to all attention that has been given to the Muslim shaheed’s pursuit of the 72 virgins, the idea of martyrdom in Islam is really more of an exaggerated spin-off of good old fashioned American machismo and hero worship. A Muslim will seek martyrdom in order to bring honor to himself and to his family, just as a Muslim will kill others even within his own family to prevent or offset a similar association with dishonor or shame. If he knows that his family will all be killed, and there will be nobody left after him to claim that honor, he will be left with little reason to pursue his murderous mission. One of the main daggers which Israel has thrust into its own heart was the government’s decision to abort the practice of demolishing the homes of terrorists. The prospect of rendering his own family homeless and desperate served to deter a potential terrorist from killing himself and anybody else by reducing the honor and machismo associated with the act. The notion of the 72 virgins is only a reward for the achievement of an act that brings honor to himself and his family, but there is nothing honorable in Islam about bringing harm to one’s family. Perhaps this is the underlying reason why, since the war of terror has begun, we have been unsuccessful in tracking down Bin Laden. And if, as many feared before the presidential election, Barack Obama is really sympathetic to the Muslims radicals, it might also explain why his main promise in continuing Bush’s war on terror was to pursue this archterrorist through the hills of Pakistan. If Bin Laden is killed and hence martyred, it will only bring honor to himself and his family, who will be very much intact and alive. That will only give rise to more militant imams and more terrorist leaders. Moreover, the only way to deal with Islamic terrorists is the same way in which they deal with their victims. Muslims believe in the literal interpretation of the Biblical doctrine of an eye for an eye, and they do not have respect for anything perceived as a lesser standard of justice. They killed our innocents, and unless we kill theirs, they will go on killing ours. The Torah, however, preaches a doctrine which, if implemented by the West, could finally put an end to all Islamic terror: If somebody is coming to kill you, rise up and kill him first. 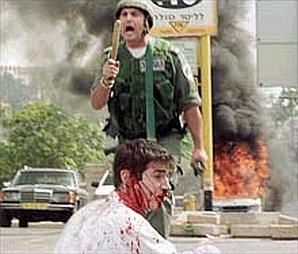 Israeli State Terrrorism - What do you think?